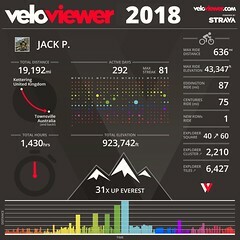 The stats and graphic say it all, one tough day on a bike. For anyone who was there, it goes deeper than that, 45km off road on a road bike at 8000ft was epic, getting up there in the heat doubly so. When I say that that is one of the maddest rides I’ve ever done on a bike; Those that know me will understand it was no gravel ride! Party Pace – The Party Line: It was about now the thought of a mythical line chasing me down the valleys appeared, like that world record line that appears in swimming and athletics coverage. 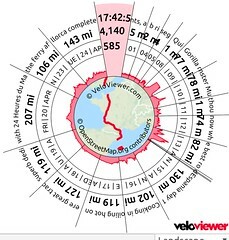 In theory a 2600 mile route covered in 14 days for a Friday night finish is 186 miles a day. After 3 days I was sitting pretty at 215 miles per day. This was my race, keeping ahead of the Party Line. Piero set off before me as I took advantage of the sizeable bathroom, between truckers washing up, to get set for a tough day. I once again felt great on the bike and passed Piero easily then stopped at the lake to grab some pictures. While writing this blog I put the Transcontinental trackleaders site on. Running playback mode, its great for me to see just the amazing variation in routes and even better to see who was around me at any time. As I approached Italy riders were suprising sparse in this area, compared to the bottle neck of Ventoux. 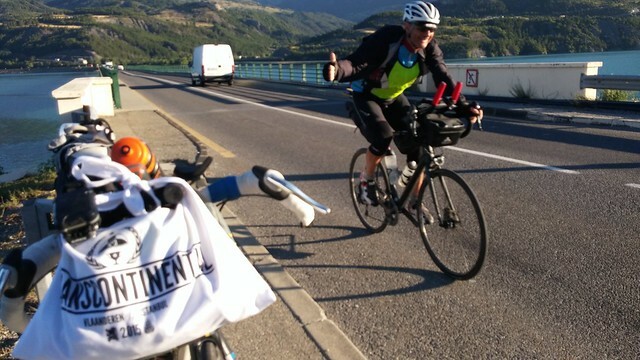 It appeared that even more than me, many had taken time out after Ventoux for a mental reset. 54 – Rod Aitchison and 64 – Ashley Sharp actually passed us during that coffee stop. I’d met Ashley randomly while on this ride, and was keenly following his progress. 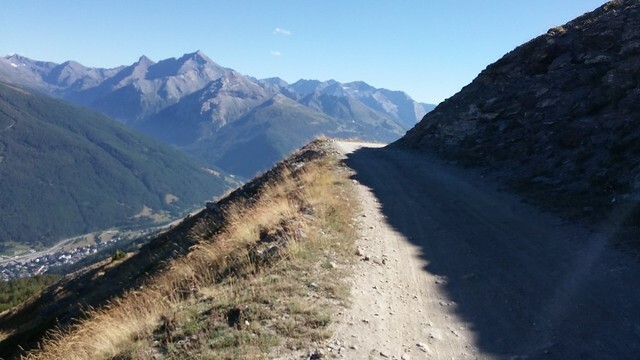 Up the valley to Briancon rather than follow the lorries and some other less prepared riders, I took to the hills. 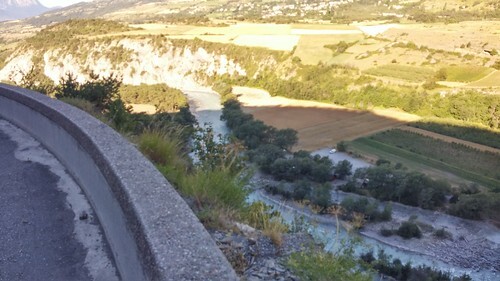 With a little more climbing, the reward was following the valley with fabulous views on the lovely Les Balcons de la Durance route. (checking the tracker afterwards I was the only one of my morning group) Right now I was on top of the world, riding well within my limits I was on pace, feeling relaxed and really loving this, bikes are great. I expected Piero to pass, or had he hammered up the main route, Rod rode by but shouted he couldn’t stop for fear of cramping up, so my nicer route appeared to be quicker too…smug! Sitting in the sun relaxed this made me feel even better shoes off giving the hard working feet some love. Looking at the tracker I noticed that Team Rapha 172b – Neil Phillips and Tim France almost joined me but I got moving again, little did I know I would be meeting them later. 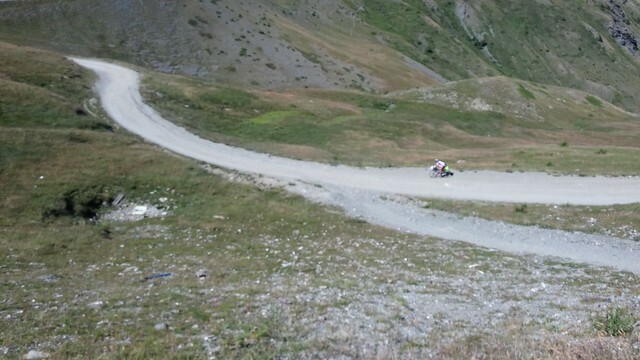 The climbing up the Col De Montgenevre was tough, endless switchbacks in hot sun and approaching the top I was briefly passed by 152 – OUAJA Stephane Now this guy was riding a fixed single gear. Staggered that he must have Titanium knees, I was keen to push on and see just how he coped with the fast descent to follow. Unfortunately he must have stopped at the summit, the descent was amazing, it flows through traffic free tunnels carved out of the hillside as the main traffic take a new tunnel route. I was smoking it, but just survived one scare on gravel so calmed it down…well relatively. 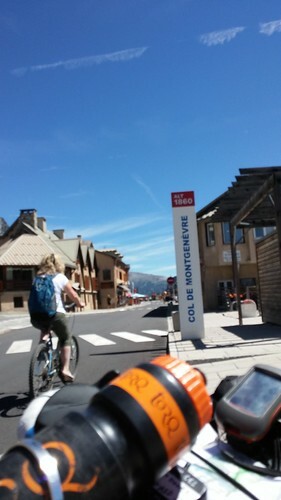 I guess a rookie mistake was not having the ride profiles to reference, dropping down I assumed this was the roll in to Italy and CP2, but a long long road climb ensued up to Sestrierre at 2000 Metres. Consoling myself that the more road climbed meant being closer to the gravel summit to follow, the slog started. For the first (and only time whole trip) I was struggling for liquid up here. As the target got closer I started to ration myself, at over 35 degs it was starting to get really tough and I cursed not stopping at the previous col. Then finally some cold mountain water pouring out from an ornate spout. the joy of soaking my merino top and putting it round my neck and pouring the cooling life saving water over my head. On arrival at CP2 it was comedy time, a queen Bee and swarm had just settled outside the Hotel, the police were stopping entry, it was all confusing as a bee keeper tried to put them to sleep. 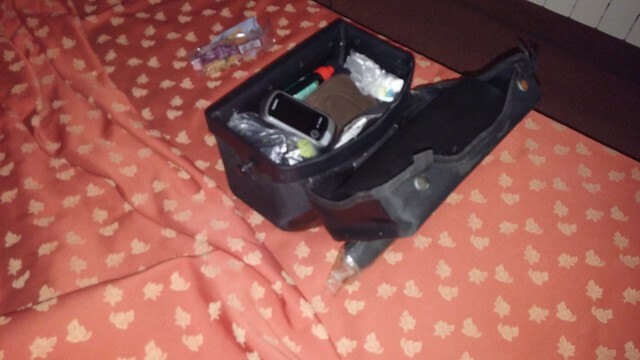 On final entry the hotel proved like all checkpoints, a veritable hive of TCR activity. Riders and bikes everywhere, Doug was here and had been for a few hours with some others, showers were on offer and riders were hiding from the mid day sun, or just amassing the mental strength to tackle D’Assietta. 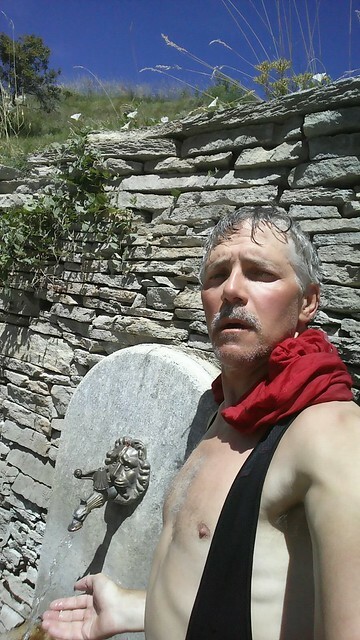 Now I was into the top 30, and learning my lesson from CP1 I didn’t want to waste too much time, Talking with CP staff the gravel section to Susa was taking the previous riders 4 -5 hours with no supplies up there. It was still too warm to crack on, and some rest was essential, I was clean from my mountain spring wash and went for a double Pizza and Omelette with chips meal nearby. Just as I left the restaurant, Doug and others set off again, getting ready and loading up with 2 water bottles and a 1.5 litre bottle strapped on back It was now or never to get this done before dark as 4pm rolled by. Starting off on the gravel section of the Strada d’Assietta it was rougher than expected but nothing to a mountainbike god like myself (told you I was feeling good), this was my domain I was ready to attack. 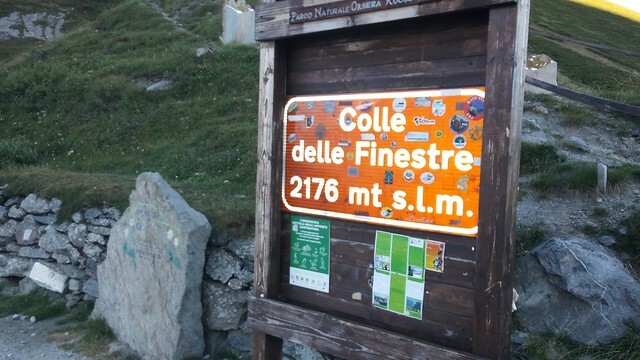 The initial climb was manageable and I took great delight in focusing on having a no dab ride as far as possible. Some sections were very loose and it took carefull line choice and regulation of power through my 28mm slick tyres to achieve. The focus of attention was just what I needed to forget todays fatigue, the air was cooling nicely, the views just stunning, If the race finished here I’d achieved my pre-race targets I was a happy dude. Soon race face returned as the rider in the photo below 137 – Andrej Zaman came into view. Back on the bike after snapping the photo the next hairpin was taken with a touch of drift and the chase was on….it didn’t take long. Perfect weather a good time of day, this had really come together to make this an unforgettable experience, a stunning part of the world it would be good to return here with a mountain bike or my motorbike. One of the three gravel road summits on this very high level trail. Going down, the trail quickly deteriorated, vehicles are allowed up here and we met several on the ride, this means loose boulders and braking ruts. Generally a pretty testing mountain bike trail, we were on stiff road bikes on slicks! Any premise of speed went out the window, this was about survival, a puncture now would be mentally deflating and time was against us as daylight faded. 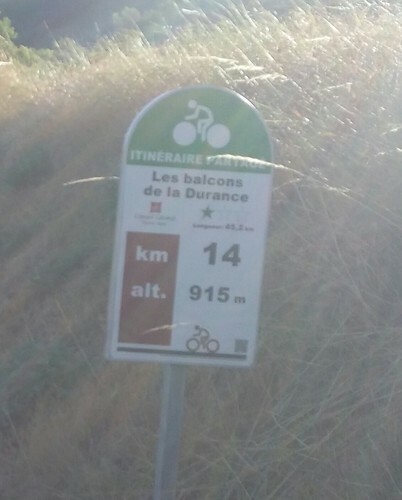 This was a long drop, about 800 metres, steep in places and the pain of constant breaking was causing some big rider hand pain. Stopping many times for hand rests we were passed by the impressive Team 172. Youth on their side, I wound my neck in and stuck with my new riding friends. 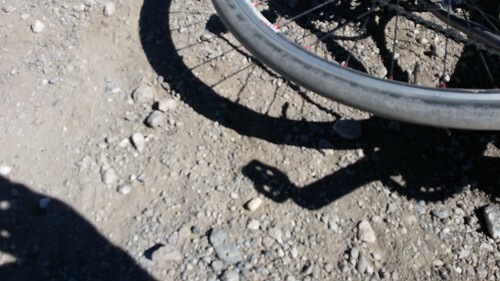 It didn’t take long to roll past team 172 fixing a puncture (it was common to hear of riders getting 4 of them on this section) we tried not to be smug but this. It was taking its toll on the body, and all sense of humour disappeared at the sheer ridiculousness of it. It was obvious to me that organiser Mike Hall had never ridden this, we were all very lucky the weather was kind. 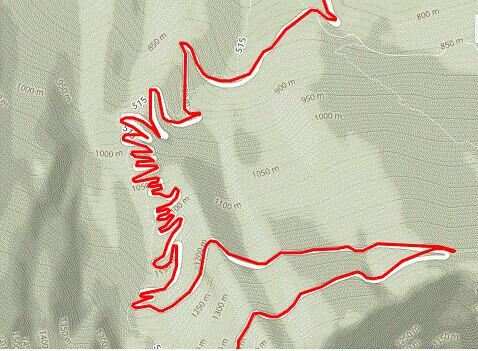 At last the bottom and tarmac……..then the GPS trace headed back up. The cold realisation that we had actually descended back into the same valley we started on did not go down well, much muttering as a 300 metre road climb to cross over the range was started. Mist was settling in the valley as light faded and it allowed some great photos of the guys as I had to rest my fading legs. Doug and his super minimalist riding set up – a fellow Salsa rider. 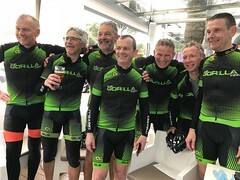 In no way was this group riding a case of riders assisting each other in this unsupported race, although the ability to vent some anguish of the task ahead was welcome no doubt. I expressed that I would be heading for a hotel in Susa, this seemed to be the general opinion of all. 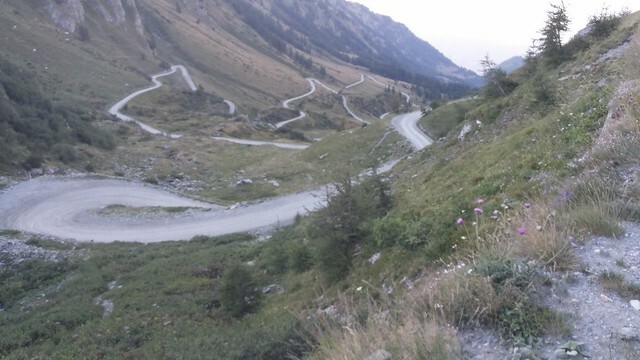 Finally the full road descent to Susa started; I remember watching Contador and his chums climbing this in the Giro 2015, it looked an amazing descent, it didn’t disappoint. Lights on, I sped off loving it. 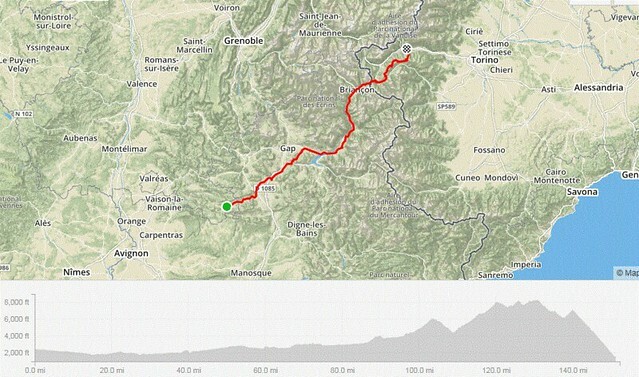 This was the craziest road descent I have had the pleasure of riding, How many 180 degree hairpins? WOW! Late braking, chuck it in, roll out to the edge, I was soon on my own. Then the view of another light across the hairpins, Team 172 were back and could sure handle their bikes. As my brakes started to fade back to the bars (yes that mental) I ignored the red mist a little and just held them off eventually to the bottom. What a buzz, the relief of completing this section intact, it was now dark and even at only 150 miles for the day a hotel had my name on it. Doug and Trevor finally rolled down the hill, both really suffering with almost unusable hands. We all opted for the first hotel in Susa, a good crack ensued over a superb meal as the emotions and tales of the ride so far flowed. One of the discussions was the team race, I had just ridden amongst the battle for the lead. would the casual confidence of team 190 out with the youthfull bravery of Team 172 over the coming days. Sharing a bed with Doug it was impressive to see the commitment, off to sleep in his only clothing and just an Ortlieb bar for a few small items. From now on he had enough kit as temperatures would be climbing from now on, worrying for him though his GPS appeared to have lost his next few days of routing. The Party Line (187/day for Fri finish): Even with todays low mileage my daily average is 199.5 miles so keeping the line at bay no problem.